Disclaimer: This post contains affiliate links. I MAY receive a small commission, at no extra cost to you, if you make any purchases via these links. But, as always, all thoughts, ideas, and opinions are 100% my own. Thanks for your support of The Crafty Cat Company! 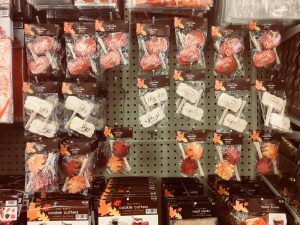 A few weeks ago, I shared my list of favorite fall picks from Michaels. But they’re not the only heavyweight contender in the game. 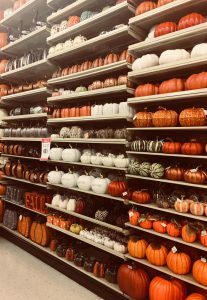 Hobby Lobby has an amazing selection of all things fall at this time of year. 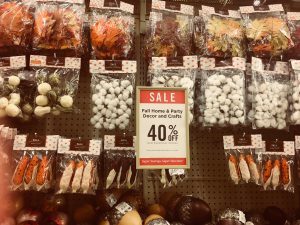 And while you may find many similar items at the two stores, Hobby Lobby has its own unique and creative offerings, which is why I thought it worthy of its own post! 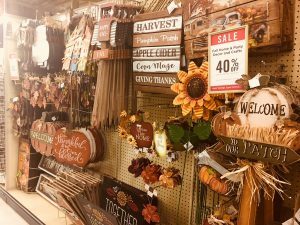 Here’s my list of 10 Favorite Hobby Lobby Fall Buys! Enjoy! Undoubtedly, having disposable plates, bowls, etc. makes cleanup after a large holiday meal easier. However, most of the products out there on the market are less-than-desirable in the way of appearance. So you bring out the fancy china dishes in order to create a presentable table, but then have to stress all evening about your nice things getting broken. And who wants that headache? 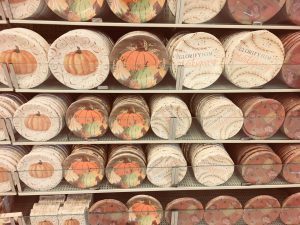 Hobby Lobby has a great solution, with their line of disposable fall tableware. It’s still something you can toss out after your party, but is a huge step up in the looks department. And, as an added bonus, they have little coordinating accessories like cupcake picks, favor bags/boxes, tablecloths, and more! Ahhh, football. If you’re a sports lover like me, you look forward to gathering with family and friends during the season to catch a game. Great company, food, and drinks only enhance the experience and excitement. 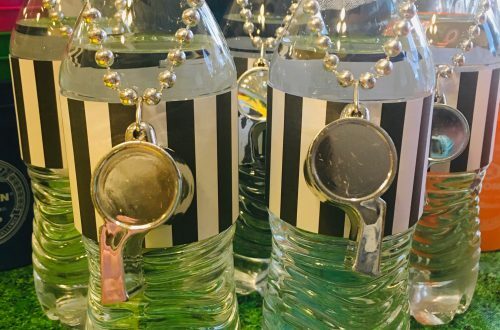 But why not do a little themed decorating to make your party even more special? 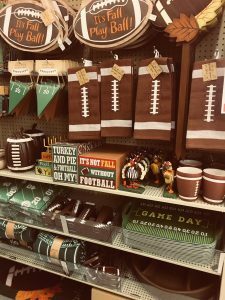 With the neat little collection of football party supplies at Hobby Lobby, you can really kick things up a notch. I especially love the dish towels and platters. They even carry a bean bag toss game that’s a perfect activity for during halftime! And, if you’re watching the games on Thanksgiving itself, these little turkey referees are sure to make your guests chuckle. 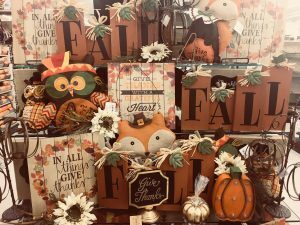 Hobby Lobby carries an impressive variety of little fall decor items, ideal for creating a beautiful display on a fireplace mantel or the Thanksgiving dinner table. They’d be perfect as filler in a vase, on side tables and countertops throughout your home… alone, or in addition to other fall florals. There are things like autumn leaves, tufts of cotton, and mini gourds of differing varieties. My favorites are probably the acorns and the little ears of corn, though! There are so many ways to use all of these products, allowing you to mix and match to your heart’s content! Perhaps you’re looking for something to put in your garden or lawn, though? This turkey garden stake would be a nice way to welcome guests to your home. And this doormat evokes the true spirit of the Thanksgiving holiday so well… plus, it’ll help keep your floors clean! You can’t have a list of fall decor items without including pumpkins! As I also mentioned in my list of Michaels fall favorites, pumpkins are probably the quintessential fall decor item. And, of course, Hobby Lobby carries them in an extensive variety. Made from foam, ceramic, wood, glass, metal, bark, fabric…. you name it, they’ve probably got it! 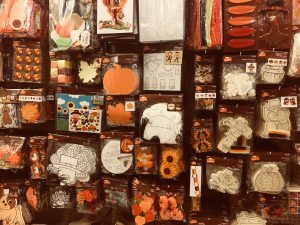 When I visited, I was pleasantly surprised to find that there were quite a few kids’ fall craft kits available for purchase. 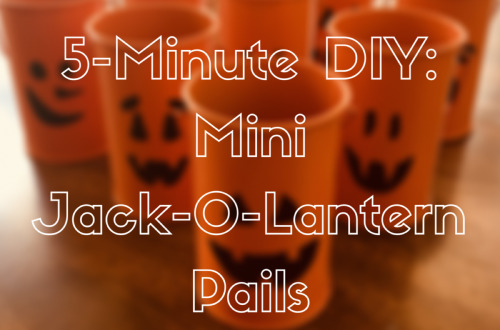 These would be perfect to help get little ones excited about the fall season in general. Not to mention, give them something to keep busy during Thanksgiving while the adults are socializing, watching football, and/or napping off the huge meal they just ate. This wooden pilgrim coloring kit and pom pom turkey are particularly adorable! And, of course, there are other singular craft materials like feathers, glitter, and stickers too-which can be used by people of all ages! 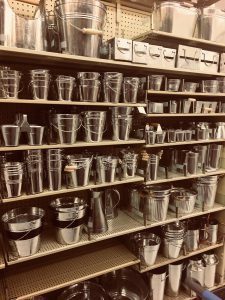 Another thing I noticed is that Hobby Lobby has metal containers of ALL shapes, sizes, and designs, that can be filled with any number of materials. They range from versatile items like a small metal bucket, to more unique ones like this trough. And metal caddies (like this one) can be used for decorative things, but would also be great for the Thanksgiving table- to hold napkins, condiments, etc. 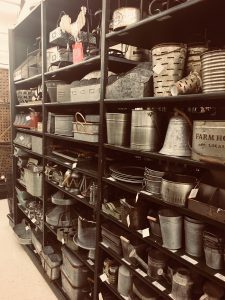 The best part is, most of the metal containers are fairly neutral in design, and can be used year-round, for all sorts of occasions! This one’s a little more unique… but also surprisingly adaptable and versatile too. These paper mache products allow for endless customization-you can use paint, stickers, glitter, fabric, more paper mache, etc. to transform these blank canvases into something extraordinary. 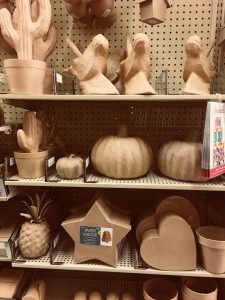 There are basic boxes in a variety of shapes, but also more unusual items like this pumpkin (perfect for fall, of course) and even a pineapple! Perfect for crafters of all ages! 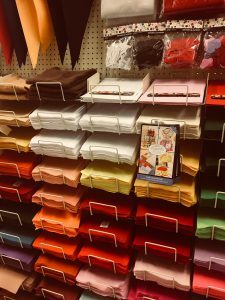 Hobby Lobby is stocked with a large selection of both basic and printed felt for all of your crafting needs. They even offer felt in varying levels of thickness and stiffness, as well as pennants, felt numbers and letters, and various shapes. A quick search on Google or Pinterest will provide plenty of ideas and inspiration for future projects! 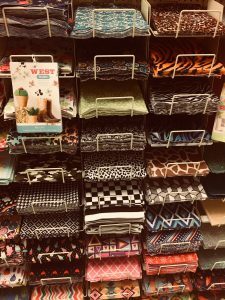 One thing Hobby Lobby has, that Michaels does not, is a large selection of fabric in-store. They carry a huge number of colors and patterns for all occasions, and luckily you can purchase it online as well. There are choices for Halloween, Thanksgiving, and autumn in general. And if you have a sports fan in the family, they also provide an extensive selection of sports-themed fabric too. 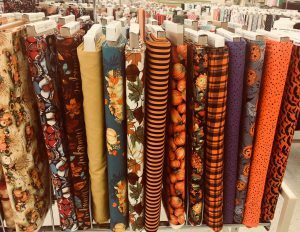 The great thing about fall is that there are a wide variety of major athletic events available to watch, and plenty of relevant fabrics available to go along with that… NFL, NHL, MLB, NBA, college sports teams… you name it, Hobby Lobby probably sells it! 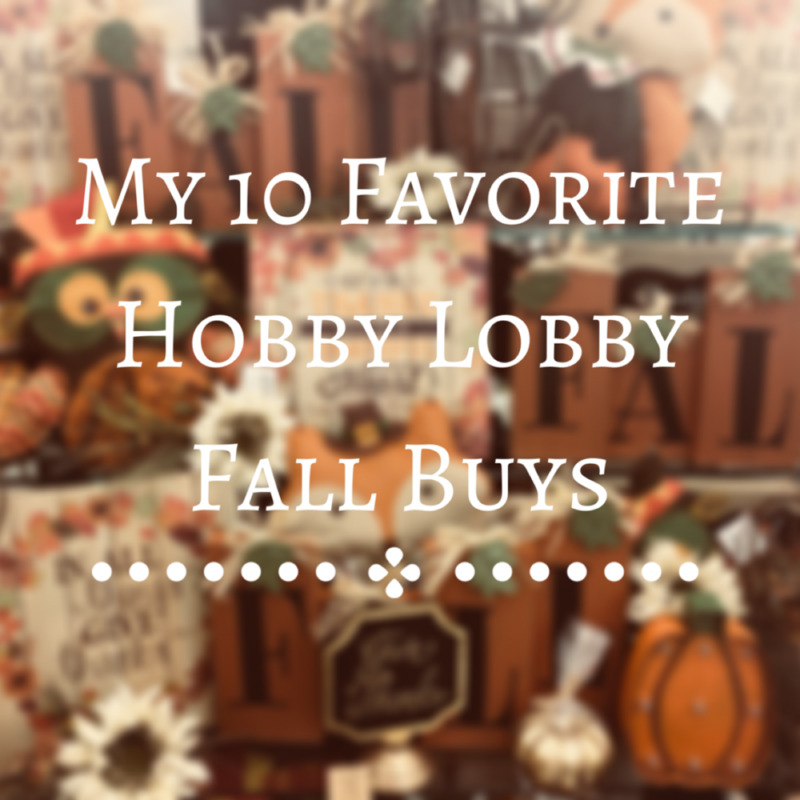 So those are my 10 Favorite Hobby Lobby Fall Buys! This list has made me so excited for the upcoming season! 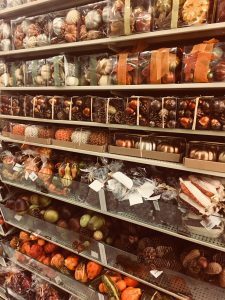 What are your favorite things to purchase from Hobby Lobby at this time of year?